All those kilometres, all those climbs and here we are la basta. The last pop of prosecco, the last explosion of the pink confetti gun, the last golden parade of the most beautiful trophy in cycling. And boy, the Giro organisers could not have planned a more exciting finale if they had tried. We have been well and truly spoilt for entertainment. Thrilled by as many plot twists and dramatic scenarios as there were sinuous curves and action aplenty on the roads from Sardinia to Milan. The route has been as brutal as it’s been beautiful and all 161 riders who finished the race deserve a mention, as well as the 34 who started but didn’t make Milan. We have had first-time winners, last-chance-saloon winners. Some expected victories and some less so. However, my rider for the race for this last stage goes to Jos Van Emden. The Jumbo Bee TT specialist has so often been the nearly man on the big stage, but this time he held on to claim a maiden GT victory. He was sobbing at the finish and I warrant everyone else was too – how could you not? On this square metre I’m the happiest man in Milan. I’m so happy because there were so many times that I was second and I always lost to someone in the GC. The tension waiting in the hotseat and now finally I can shout it out. First I saw I was two seconds faster and then six seconds faster. My second part was really fast but then I saw him [Tom] coming through the final part and the clock was ticking. I couldn’t watch it any more, I was shouting. So many emotions, winning a stage in a Grand Tour. I’m a firm believer in the adage that the only people who deserve to be on the podium are those that stand there. All three men have won stages at this race. Vincenzo Nibali and Nairo Quintana can count 3 Giros, 2 Vueltas and a Tour de France between them and that experience counted today when they needed to steady the ship and ride for the podium. 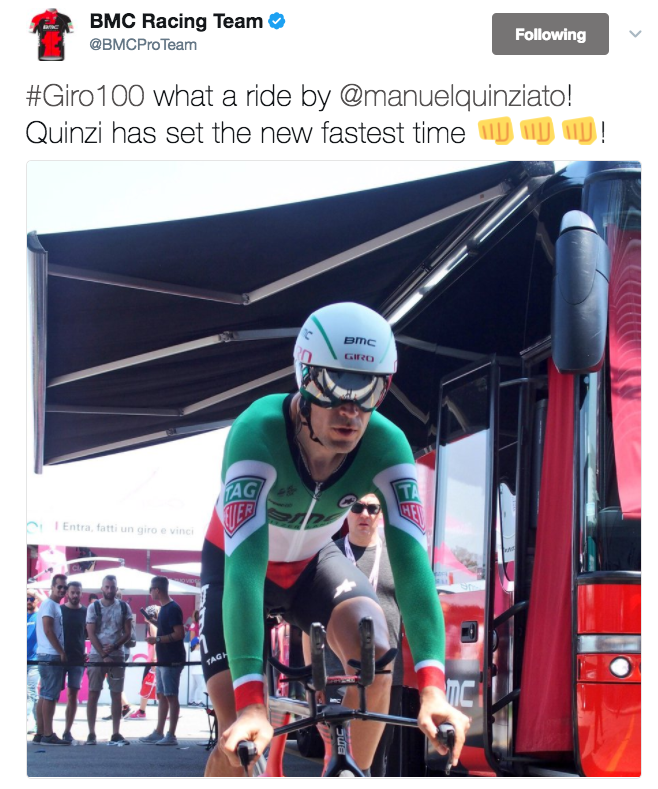 And yet they were beaten by a man who has come of age in Italy to win his first Grand Tour. The big Dutchman Tom Dumoulin has won the hearts of fans all over the world with his riding and dashing looks on the podium. Yes, of course, he took time in the time trials, but let’s not forget he also won atop Oropa. Nothing put him off his stride, not the loss of Wilco Kelderman, not the fact he was often isolated, and not stomach troubles. The brutal fact is the rest of the field just couldn’t put enough time into him on the climbs. They distanced him plenty of times, but he sailed through each crisis, limiting his losses and keeping his rivals in sight until he could meet them on his preferred territory. And let’s not forget that his team Sunweb have been transformed from sprint aces to GT victors in just two years. I’m going to give the last word to teammate Laurens Ten Dam. He impressed me so much in the mountains this year. I knew that he was going to do great TTs but on Blockhaus, on Oropa, even on a bad day he was able to limit his losses without Wilco. With Wilco, he would have been in the jersey today already. As a team we showed ourselves. I’m so proud of the boys and especially Tom. The maglia rosa was not the only jersey that swapped shoulders today. Best Young Rider was also settled on the road from Monza to Milan. It’s been a real tussle all the way between Quickstepper Bob Jungels and Orica-Scott’s Adam Yates, but the Luxembourg champion overcame his 28sec deficit to add another maglia bianca to his palmares. The organisers define the Young Rider prize in three words: Youth, enthusiasm, and stubbornness. I’d say young Bob more than showed us those attributes. It’s been a great race for the Quick-Step team who also claimed the maglia ciclamino with Colombian sprint sensation Fernando Gaviria and one of the two team prizes on offer. Sky, who had a race ruined with bad luck and accidents, will be thrilled that Mikel Landa brings home the King of the Mountains jersey. Another of the many brilliant things about the Giro is the huge number of prizes they hand out. One that particularly caught my eye is the one for the most number of kilometres spent in a breakaway. We all know how hard it is to get into a break, let alone day after day with little to show for all the effort except some valuable sponsor time. I think it’s fitting this should be celebrated and was thrilled to see Pavel Brutt (GAZPROM-RusVelo) have his Milanese moment. I know I won’t be the only one, as Fabrizio picked him for rider of the race for just such an exploit on stage 13. Today saw BMC’s Manuel Quinziato make his Giro farewell. The Italian was really motivated to show his fabulous national champion’s skinsuit to the crowds and flew around the course to finish third. Honestly, it’s my last Giro and one of my goals and the main reason I rode the Giro d’Italia was because I could wear the Italian jersey in the TT in Milan and I really gave it everything I had left. I think I did a performance where I can’t regret anything. There are a lot of strong competitors so let’s see what happens. It was special. This morning, my wife and kid were at the start and we took a couple of pictures with me because we wanted him to remember his daddy when he was a bike rider.